Hormone Balance with Seed Cycling — Nutrition. Designed. I have some AMAZING news everyone! I am officially a holistic nutritionist! I had my final presentation yesterday and it went great! It was a fast and fun 18 month program. I enjoyed being back in a physical classroom again with some amazing individuals. It even looks like one of my colleagues and I will be starting a corporate wellness lecture program together. Now the students becomes the teachers! Eeekkkk!!! Aside from all that wonderful news I am starting to work on developing my own private practice and moving into some cool new office space with some amazing doctors and other wellness practitioners. Naturally, I thought the blog (if you can call my irregular, once a month posts a blog) would turn a little more into a holistic health space. Yeah? Cool! So I planned to start off slowly, you know talk about macronutrients, different foods and what they are good for, etc. You know more basics and foundations and then get more into the juicy stuff. HOWEVER... last week over snapchat (yeah I have one of those too... right now it's ymontoya, but that's my maiden name and I am switching it over soon to NutritionDsignd, so stay tuned) I posted a flyer about seed cycling and got a great response and lots of questions from it. So... I decided to write a larger more in depth post on seed cycling for everyone interested. Just to back up for a quick second, a big part of what got me interested in holistic nutrition was my painful journey off birth control. Though I have come a long way, I still am struggling with it at age 33! Ugh! So, in finding more out about what it going on in this body of mine, I sought out a naturopathic doctor to help me run some tests. After doing the DUTCH test (I can talk about this more in depth too, just comment below if you'd like this) we talked about my hormone balance and among a few things, she suggested seed cycling. I know hormone balance can seem like a very trendy term being thrown around out there right now. And it’s for good reason. Hormones are pretty delicate. They influence and impact every system in our bodies. These imbalances are related to various things including our food and lifestyle choices, exercise, chronic stress, environmental toxins and even age. And can cause a host of issues including adrenal fatigue, inflammation, dysbiosis, weight gain and PMS. All of these are symptoms are our body’s way of signaling to us that something is out of balance. Yup, even PMS. That thing that we are taught at such a young age is a normal part of our health as a woman. But just know that while it may be “normal” today it is NOT RIGHT and it is our body crying out for help. Great news is, we totally have the power to fix it ourselves! So let's start! So, what is seed cycling exactly, you ask? It’s a process of using specific seeds in our diet based on where our cycle is to aid in proper balance and elimination of hormones. What can seed cycling help with? Now, holistic health can get a little too woo-woo for me sometimes. But rest assured that if I am recommending it or writing about it, it’s rooted in science (some references are below, but if you’d like more, email me). Day 1 refers to the first day we begin to bleed. During this phase our bodies are using estrogen to prepare for ovulation. Having too little will hinder ovulation and too much estrogen will cause those severe PMS symptoms. This phase is correlated with low hormones. The aim in this phase is to balance estrogen and discard the excess properly. Pumpkin and flax seeds combined help the body to eliminate the extra estrogen that occurs at this time of the month. The lignans (an antioxidant chemical compound found in plants, especially high in flax) bind to this extra estrogen and properly eliminate it by helping us carry it out of our body. Pumpkin seeds are high in zinc and phytoestrogens, stopping the estrogen from converting to a harmful form of testosterone and help with progesterone production that is needed in the Luteal phase. Omega-3s aids in cell communication and lowers inflammation, both of which will contribute to balanced hormones, especially estrogen and progesterone. Day 15 refers to the beginning of ovulation. This is correlated with lower estrogen and higher levels of progesterone which build up the walls of the uterine to prepare for pregnancy. When pregnancy doesn’t occur, progesterone decreases and the lining is shed (menstruation, beginning phase 1). Progesterone is needed for a healthy pregnancy and when not balanced it can cause painful menstrual cramps. Sunflower and sesame seeds are rich in antioxidant nutrients like vitamin E, zinc and selenium that can improve damaged cells, keep cells healthy, help the liver detox, proper thyroid hormone conversion, balance blood sugar and help with progesterone production. They are also a great source of the essential fatty acid linoleic acid (LA), which can convert to gamma linolenic acid (GLA) to help balance progesterone and estrogen. Evening primrose oil is also great source of omega-6s essential fatty acids: LA and GLA, that support overall hormone function. 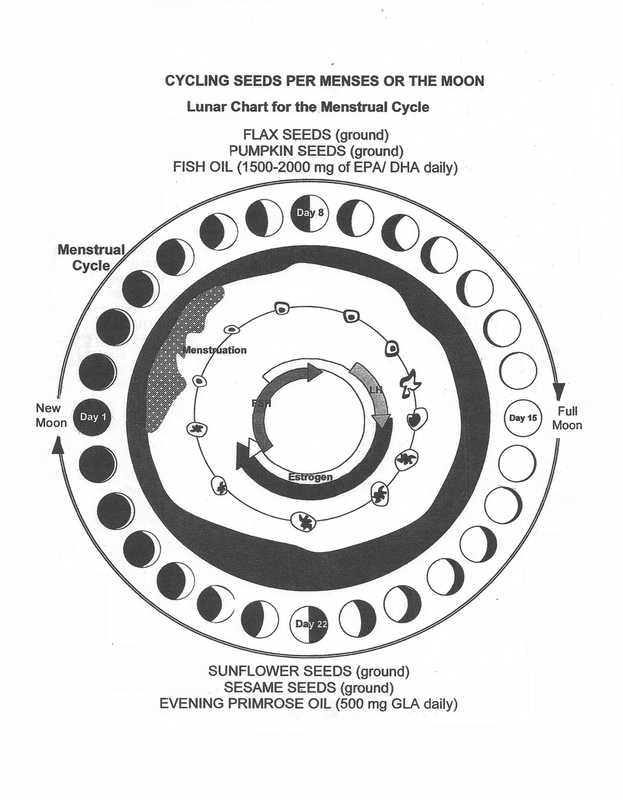 If your cycle is missing (and recommended that you are not on birth control) start phase 1 seed cycling on the new moon. Continue on a 28 day cycle even if your are not syncing up and your body will eventually balance out. Seed cycling isn’t the end-all-be-all answer for hormone balance. And just like the amount of time it took to get an imbalance of hormones, this didn’t just happen overnight, seed cycling is not a quick-fix. It is known to take 3-4 months before you see results. However, some have seen results in the first month, or at least some improvements like less moodiness and cravings. More is not better here. Stick to the 1 tablespoon of each seed recommend daily, more will only confuse your body and it will not be able to find it’s natural rhythm. It's a try keeping a detailed journal of your daily moods and symptoms. This will really help you stay in tune with your body and help to see the changes that occur. This post is aimed at women’s health, but be sure to know men’s hormones can be helps with seed cycling as well. In fact, men’s hormones suffer from the same metabolic imbalances that women do, but because have fewer hormones fluctuations and because they are men they often don’t seek help for it. Therefore, it’s not talked about a lot. However, their hormones closely mirror those of women, being most fertile at the full moon. *Why do the seeds need to be freshly ground? This is most important in the flax seeds, since these have a harder shell to protect its nutrients inside, they must be ground in order to be assimilated in the body, otherwise they will simply act as insoluble fiber and be passed right through your body. In general, its best to grind them all in a mortar and pestle, blender or coffee grinder the day of (though they will last for up to 2 days if you want to grind them every other day, otherwise they will go rancid). This will break down the shells of the seeds and make the nutrients more easily absorbable for our digestive system. And please keep all raw seeds (and nuts) in the fridge to keep them from going rancid. If you have any kind of digestive issues you can go an additional step and soak your raw seeds overnight and throw them in a smoothie or otherwise. Or after soaking you can then sprout them or dehydrate them in a dehydrator or the lowest temp in the oven in order to preserve the most nutrients in them by not heating them too high. This soaking and sprouting processes allow them to be more easily digestible and provide the most easily absorbed nutrients in our bodies. Do whatever you can or have time to, either way don’t let any of these processes get in the way of trying seed cycling. You can simply throw the raw seeds on a salad, in soups or anything really, just make sure you chew well to break the seeds down. Simply know that if you don’t grind your seeds it may take a little longer to see the same results. **If you are pregnant or planning to be, here’s a great article by naturopathic Dr. Amy Neuzil on Seed Cycling for Pregnancy. Sorry for such a long post. I normally don;t like to write this much, but it's hard when it comes to health and our bodies, I would rather be thorough than brief. Have you ever tried seed cycling? What are your thoughts about it? Hit me up if you have any questions about nutrition, health or wellness. I am always here and love to share what I can!